Fall in love with the signature scent of Sonesta Hotels. 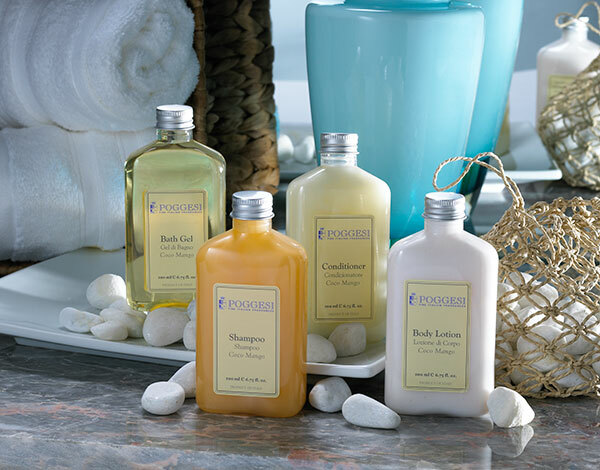 The Coco Mango Bath Collection by Poggesi is an invigorating blend of warm spices, zesty orange, sweet jasmine, and lily. Gentle enough for every day use, this hydrating, nourishing assortment includes shampoo, conditioner, bath gel, and body lotion. For a smooth, silky finish from roots to ends, follow your shampoo with Coco Mango conditioner by Poggesi. Slowly awaken your senses by breathing in the signature scent adored by Sonesta hotel guests - the pungent tang of citrus, sweet floral scents of jasmine, lily, and comforting notes of warm spices. 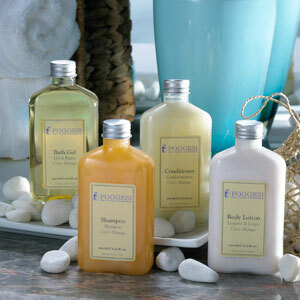 You'll feel like you've retreated to the spa when our signature Sonesta scent perfumes the air. The Coco Mango bath gel by Poggesi blends sweet jasmine and lily with warm spices and is finished with a kiss of citrus, delighting the senses and soothing your muscles. Made with a base of purified water, this lathery bath gel leaves skin hydrated and refreshed.